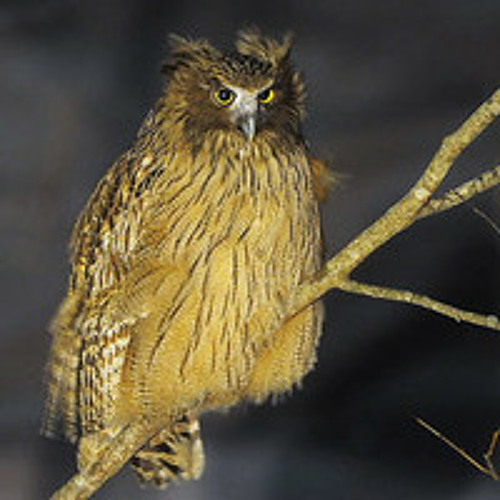 Blakistons Fish Owl is the largest owl species in the world and also one of the rarest. Found in eastern Siberia, China, Japan (Hokkaido), and probably North Korea, the very small population is rapidly declining due to widespread loss of riverine forest and increasing development along rivers and dams, it's preferred habitat. Interestingly, pairs often vocalize in duets. In this recording from Hokkaido, Japan, four distinct notes can be heard. In mainland populations it has been suggested that the male produces the first and third note, and the female produces the second and fourth notes. Whether this is the case in this recording is not confirmed. In any case it's a unique sound that illustrates we still have much to learn in the world of bioacoustics. This recording has been cut down in size so three duets can be heard in a short space of time. Note that in the original recording the time between vocalizations was 45-55 seconds. Audio Source: David Mellor, XC116370. Accessible at www.xeno-canto.org/116370 Published on Soundcloud with permission from David Mellor. Photo Credit: Robert TDC Blakistons Fish Owl duet (Bubo blakistoni): Recorded by David Mellor by Wild Ambience is licensed under a Creative Commons Licence.